I (Cherry) am introducing some skin care items. In this time, I do Sekkisei. In my late 10s to mid of 20s, my main problem was acne. But now, in early 30s, my problem is brightening. Sometimes my skin is quite sensitive to use toner/lotion which contains ethanol/alcohol. According to BA in a Japanese brand, she insisted most of the toner/lotion with ethanol/alcohol in here Japan. In my personal experience, it was pretty hard to find things without ethanol/alcohol. I used some with ethanol/alcohol, and some are less problem, but some hurts my skin. This is quite famous about brightening lotion, but I had avoid to use it years, because it contains lots of ethanol/alcohol. Since 2 years ago or so, Kose is selling 24ml small trial bottle in every summer. I gingerly used it. I admit I felt small pain– pricking for few seconds, after that there are no problem. After finishing this small bottle, I found my skin is a little bit brighter. The reason why I do not use it for all seasons, it is light. In summer, it is good point, but when it comes to drier, it is the bad point to use. 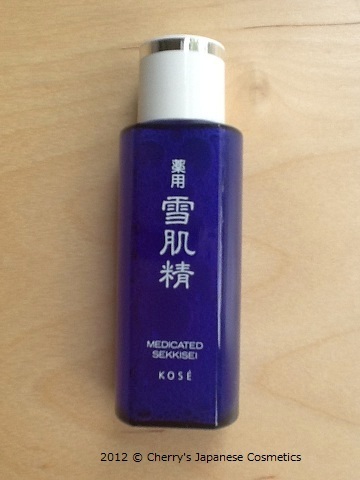 In this summer, Kose also selling this small bottle, exclusive for summer. Few days ago, I had done with my first bottle of this summer. Yes, my skin turned a little bit more brighter. I recommed this bottle for those who; Not so weak for ethanol/alcohol, oily-conbination skin especially those who are in high humidity area/ season, seeking brightning lotion. This one works for toner/ lotion, but originally it is designed as booster/ pre-lotion. Namely after washing your face, use it before your toner/lotion. Use a cotton. Kose insists to do patting, but I am afraiding it hurts my skin. I never pat my face, but put softly. We are not dealing this product regularly. If you want to have, please tell us the quantity and the country where we need to ship to. We are going to custom order.